In this edition of the bi-weekly bulletin, we give the floor to Michael Herschman, CEO of the ICSS and we have some articles regarding match-fixing in Australia. Another case of a young athlete charged with match-fixing continues to prove that young players are very vulnerable to competition manipulation. The Tennis Integrity Unit is stepping up in their fight against match-fixing with smartphone apps and warnings to young and experienced athletes. Finally, we note significant developments in international cooperation on anti-doping policies in Kenya. 2016 was a turbulent and tumultuous year for many in sport. Match-fixing, doping, and compliance and governance issues have affected organisations at all levels of the industry. As a result, never before has there been so much scrutiny in sport, never before has the public spotlight shone so brightly on integrity and governance, as well as the conduct of organisations and leaders within the sports industry. On the field, many sports are unrecognisable compared to 20 years ago. Of it, interest and investments continue to increase, revenues are rising and, whilst the industry should be congratulated for the incredible progress made, plenty more can still be done to protect and safeguard sport from match-fixing and the many integrity challenges it now faces. 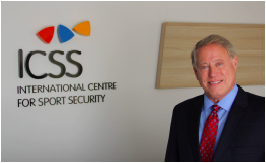 As an organisation created in 2010 to help safeguard sport, ICSS has brought together many international experts from all sectors of the sports industry. Last year, I joined the organisation as Group CEO to support its mission and to enhance its existing portfolio and offer to partners within sport safety, security and integrity. ICSS has made an active contribution to help fight match-fixing including the ICSS-UNODC Resource Guide on Good Practices in the Investigation of Match-Fixing (1), Financial Integrity and Transparency in Sport (FITS) Football Study (2) and Sorbonne-ICSS Guiding Principles (3) which help advise policy and bring together expertise and key decision-makers. Along with our work in educating and warning numerous organisations, athletes and officials about match-fixing, ICSS has also worked alongside UNESCO to host a special meeting (4) which brought together over 100 experts to follow up on the recommendations and commitments adopted in the MINEPS V "Declaration of Berlin" on the manipulation of sports competitions. This collaborative approach and gathering of global expertise in one place lies at the very heart and ethos of ICSS. These efforts - as well as the many other positive examples of ongoing anti-match fixing initiatives currently taking place around the world – will be crucial in ensuring that sport in 2017 is properly equipped to prevent the manipulation of matches and that legislation is strong enough to empower law enforcement agencies at national and regional level to combat organised crime in sport. Match-fixing is a truly global problem that directly affects many sports and countries around the world. Combatting it will require full support and giving greater resources to empower law enforcement, not to mention understanding and navigating a range of complex cultural, social, economic and political factors in different countries and regions. If trust is to be restored to sport in 2017 and we are to have real success in the fight against match-fixing then collective action, collaboration and empowering law enforcement with the right tools will be key. I hope that 2017 will be a year where new partnerships are forged, greater expertise and experiences are shared and all sectors put aside their differences and come together for the collective good and integrity of sport. Australian former tennis player Nick Lindahl has been banned for seven years and fined $35,000 (£28,000; A$47,700) for match-fixing. The Tennis Integrity Unit said Lindahl plotted to throw a match at a minor Australian tournament in 2013. Two other Australian players, Brandon Walkin and Isaac Frost, were also disciplined over the incident. It comes days after Australian Open junior champion Oliver Anderson was charged with match-fixing. Last year, a joint BBC/Buzzfeed investigation alleged the TIU failed to act on suspicions that 16 top-50 ranked players have been involved in match-fixing. Lindahl, 28, achieved a career-high ranking of 187 in singles before retiring in 2013. The TIU, which is responsible for policing tennis, said the offence happened at the Australian F6 Tournament in Toowoomba, Queensland. "He was found guilty of charges of contriving or attempting to contrive the outcome of an event, and failing to co-operate with a TIU investigation," it said in a statement. The penalty means Lindahl will not be able to resume his international playing career or attend official tennis events for seven years, the TIU said. He had already been fined A$1,000 by a court in New South Wales last year. Walkin, 22, was handed a six-month suspension for "passing a corrupt proposal to another party" on behalf of Lindahl. But the 1,066-ranked player is free to compete after his penalty was suspended for six months, subject to further breaches. Frost, 28 and ranked 1,515, refused to hand over his mobile phone during the investigation. He will not be further penalised after serving a provisional suspension between October 2013 and September 2014. Kenyan athletes on Monday backed a plan for a team of six internationally accredited doctors to take care of the country's top-level runners and be responsible for examining samples in an effort to end a series of doping scandals. The doping cases threatened to derail Kenya's participation in last year's Rio Olympics, but its athletes were eventually allowed to compete and brought home a haul of long-distance running medals. "This is a good step and a major development for our country. I am happy with it, although authorities still need to make athletes aware of the dangers of doping," Olympic marathon champion Eliud Kipchoge, 34, told Reuters. Athletics Kenya, the governing body for track and field in the East African country, says elite athletes should only use the six doctors vetted by the International Association of Athletics Federations (IAAF) if they want to compete. "You have to go through this network, inside or outside the country. They will be writing monthly reports to the IAAF," said Athletics Kenya Chairman Jackson Tuwei. Tuwei said 49 Kenyan athletes had violated doping rules in the past five years. Kenya is still on the World Anti-Doping Agency's watch list. "Athletes who won’t conform (to the plan) won’t be allowed to compete," he told around 100 top athletes at a meeting in Eldoret, 350 kilometers (217 miles) northwest of the capital Nairobi. Olympic champion and London marathon winner Jemima Sumgong said the plan would help honest athletes. "It will make it easier and faster to do a medical, now that there are six doctors whose contacts have been given to us," she said. "This is a good start to eliminate doping." The IAAF said the initiative was not intended to vet athletes, but to provide good quality medical support. "The network comes as part of the preventive measures intended to address the proliferation of rogue doctors, limit poor medical practice, and address the supply of prohibited substances," Chris Turner, a spokesman for IAAF, told Reuters. The INTERPOL Integrity in Sports Unit and the International Olympic Committee (IOC) will host an International Law Enforcement Workshop addressed to investigators.